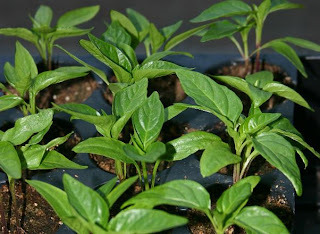 An update on our seedlings. They have been removed from the artificial light gravy train and are now living in our unheated solarium. Night time temperatures regularly get down to about 50-60 degrees which is the minimum temperature that tomatoes will tolerate and continue to grow. During the day, the temperatures get up to 70-90 degrees depending on the amount of sunshine. Our days are now 11 hours long, so they are getting a fair bit of light during the day. The windows in the solarium are angled to allow maximum light to come through. It's really a great set-up. 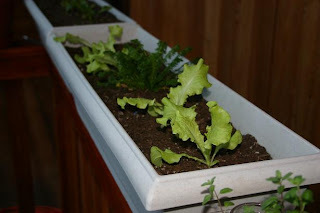 Above is some lettuce and chamomile both started from seed. We're hoping to have a salad in a few weeks. These pepper plants above really need to be thinned. We're just waiting for the local garden store to get in 4" pots. I was dreaming about planting these peppers out in the garden last night. Couple more months before that can happen. 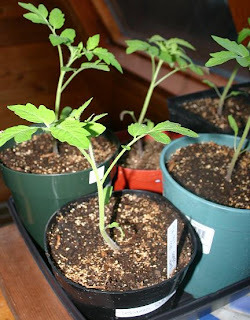 Once we moved the tomato plants out of the seed trays and into these pots they really started to take off! They're getting pretty big. 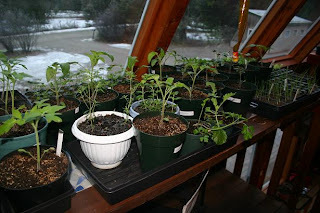 I'm thinking another month in the solarium and then planting these out into the greenhouse where some will stay, and some will wait for our last frost date to pass. 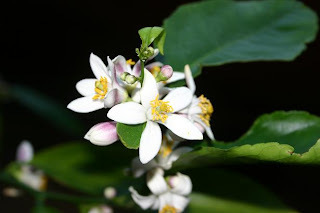 Our citrus trees are blooming! The lemon tree is heavy with blossoms. These smell so good. Unfortunately, the trees all lost a fair number of leaves during the winter so I think we'll be removing any fruit that sets to let the trees get some more foliage. In the next couple weeks we'll be installing raised beds. I'll post pictures of that progress when it happens. ooooooohhhh. I have tomato envy. And pepper envy, and lettuce and lemon also. Your plants are looking sooo nice! I'm hoping the tomatoes aren't getting too big. I might start some more tomatoes a bit later and compare their production this summer to see if there was any advantage to getting such a head start on the season. The solarium must be a Solarium Concept Ultra.